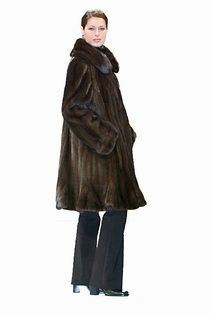 A new look in mink coats! 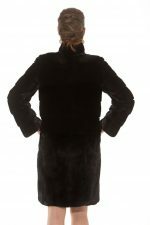 Sleek, sophisticated mink in deep, rich, black mink in a new modern silhouette that is chic and elegant in a light new form. 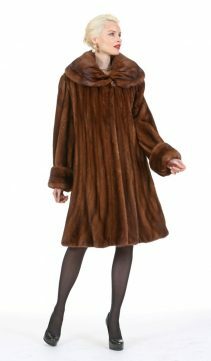 Horizontal bands of mink in the upper body and sleeves contrast with the skin on skin blocks of mink in the skirt of the coat. Easy to wear – with a quiet flair! Fur Content: Full Pelted Skin on Skin and Fully Let Out Female Ranch Mink. Fur Origin: Denmark. Length: . Side Seam Pockets. Hook and Eye Closures. Available up to size 4- 14.